“The Mexican” An original stoptail 65 in cherryburst. Found this one in old Guadalajara. This had all the 64 features-even the wide bevel truss cover. 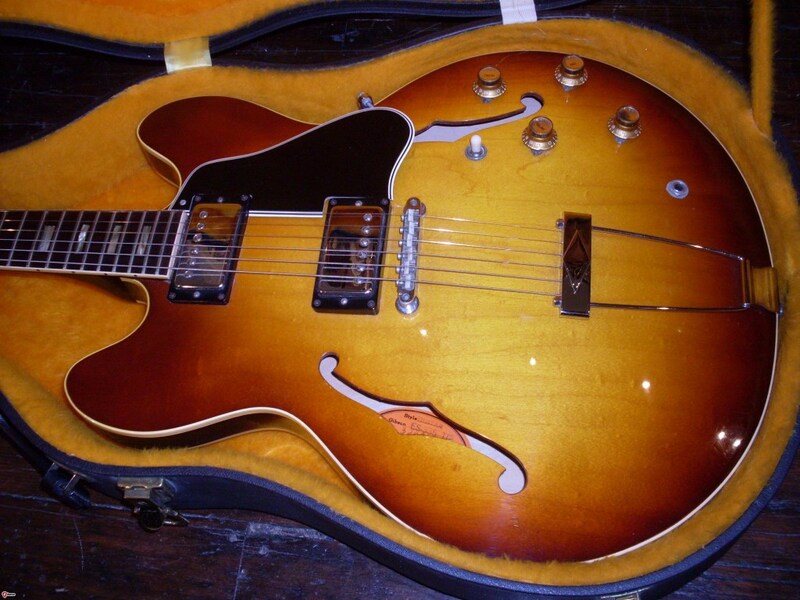 Gibson serial numbers are notoriously worthless once you hit 1965. It’s not just that they started using the same numbers over and over again for the next ten years. It’s that the features of the guitars don’t always seem to follow the serial number chronology. 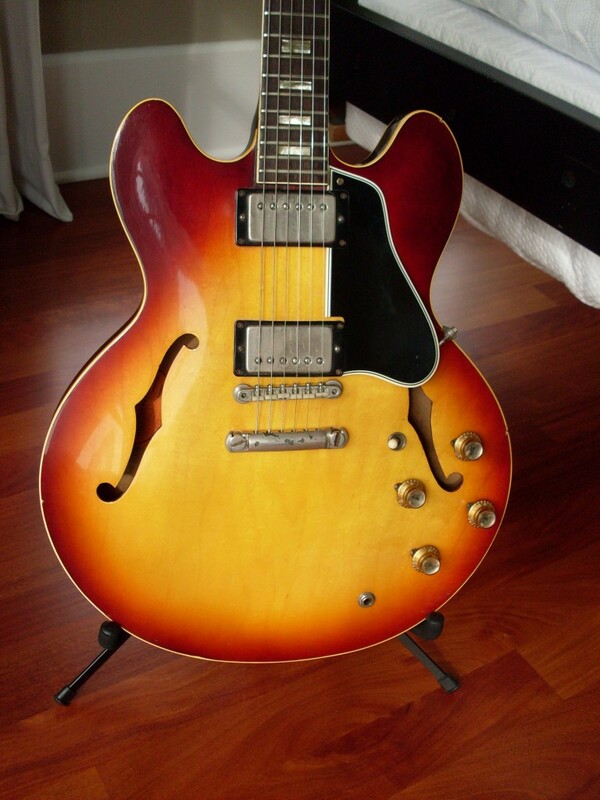 Granted, it’s tough enough to figure out if the 335 you have (or want to buy) is a real 65, but once you’ve established that it is, you’ve only scratched the surface. 65’s come in more configurations than any other year. Whaddya mean? It’s a 335, isn’t it? Well, yeah, but there were so many changes made during that year that it’s like having two or three model years in a 12 month period. The very first 65’s had a stop tail and all nickel parts. They were virtually identical to a late 64. They are also rare and expensive and priced like a 64. That’s the easy part. Where it gets tricky is right after they went to the trapeze. The first trap tails were also (other than the trapeze itself) pretty much the same as a late 64. Double line Klusons, nickel ABR-1 with no patent number, nickel covered patent number pickups and that big ol’ neck profile and wide nut. The only change beyond the tailpiece was the truss cover. Virtually all 64’s have the wide bevel and nearly all 65’s have the narrow bevel. Then, sometime in the Spring, things started to transition-by fits and starts and with no consistency whatever. It’s like they dumped a load of chrome parts into the nickel parts bin and stirred it around. The mix of nickel and chrome that followed defies logic. Some had one chrome pickup cover and one nickel. Chrome tailpieces and nickel bridges are pretty common. The nickel pickguard bracket seems to have lingered right into 66-they must have had a lot if them around. Nickel and chrome look somewhat alike when new so folks probably didn’t notice until years later when the nickel tarnished and the chrome didn’t. To make matters even more complicated, they changed the neck profile from a chunky carve with a wide 1 11/16″ nut to a slimmer carve with a 1 5/8″ nut for about a minute and then to a 1 9/16″ nut and a fairly slim profile. Not complicated enough for you? OK, how about the fact that there is no clear correlation between the changes and the serial numbers. My general rule for 65’s is that if the serial number is under 340xxx, then it’s bound to have some nickel parts and the bigger nut. I’ve had plenty of wide nut 65’s in the serial range of 250xxx to as late as 340xxx. I used to think around 329xxx was the start of the transition but I’m wrong. I have one in that range that is all chrome and the small nut. I would venture to guess that in the 329xxx range, it is possible to get a 1 11/16″ nut, a 1 5/8′ or a 1 9/16″ nut in any and all combinations of nickel and chrome. One other important note-no T-tops in 65. I know, everybody who is selling a t-top will tell you it’s a 65 but I’ve never seen one. The pre T is actually pretty consistent through 66 and into 67. I’ve seen them in 68 and even 69 when the t-top was well established. The larger point is that when you’re looking into a 65, make sure you are getting what you think you are getting. Ask for a photo of the nut with a ruler next to it or better yet, calipers. Don’t just ask the seller to measure it. Most people can’t read a ruler. Look closely at the hardware. If nickel hardware is important to you, don’t ask the seller. Again, most folks can’t tell the difference between nickel and chrome. Ask if its tarnished. Look at the photos and see if its tarnished. And remember this-an early big neck wide nut trap tail 65 is worth up to $2000 more than a later narrow nut. The narrow nut 65 is going to sound just as good and can be a great bargain but you’ve got to be comfortable playing one. This is the other end of the 65 spectrum. All chrome parts, small nut width and a narrow bevel truss cover. And yet the serial is 329xxx which is well within the mostly nickel and wide nut range. Go figure. Don’t matter what guitar you play if you play like BB. A lot of folks with a lot more guitar cred than I have already weighed in on the loss of the great BB King. He certainly was the common denominator that links most blues players, would be blues players and wannabe blues players together. We all stole licks from him and we all tried to emulate his wonderful economic style. BB could play one note that said more than any 20, no, any 100 I could play. But his skill and technique also points out something that vintage aficionados hate to admit. I was just listening to a clip from 1972 wherein BB was playing an early 70’s 355. It could have been custom but I doubt it. It looked like an off the rack walnut finished 355. And, in case that isn’t enough, he was playing through a solid state (non tube if you’re under 25 and never heard the term “solid state” before) amp-it looked like an Acoustic Control. Vintage guys like me don’t like 70’s Gibsons very much. The quality suffered under Norlin and, while there are still good ones, there seem to be more bad. Not for BB. I think he proves better than almost anyone that the player transcends the instrument. For hack players like me, I can say that there are guitars that make me a better player and they are mostly old. 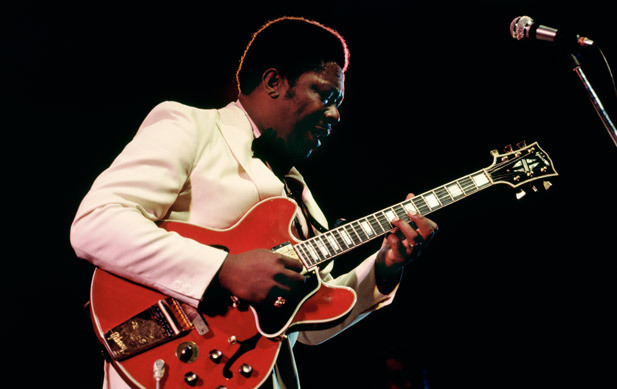 But for a man like BB King, the guitar is merely the link between the player (and his experience) and the audience. His tone comes from within, not from that wooden box with the strings on it and all the little electronic bits inside. Those of us who play the blues because we know the notes aren’t doing the same thing as a bluesman. What does a guy from suburban upstate NY from a middle class family know about the blues? Yes, we’ve all had some hard times but that doesn’t make me a bluesman. I don’t know what it takes but I know it when I hear it. Those British kids in the 60’s who co-opted American blues did us suburban white kids a favor. They introduced us to a genre that was right in our backyard that we barely knew existed. There was a time not that long ago when mainstream radio (it was AM back then) wouldn’t play black artists playing what was then called “race music”. They would have white guys (like Johnny Rivers) do covers and those were the songs that made the airwaves up here in the North. By the mid 60’s that was changing but I’m willing to bet that I couldn’t have found BB King on the radio in Schenectady, New York in 1963. I saw BB King a few of times over the years and he was always entertaining and sometimes mesmerizing. I saw him in his 50’s, his 60’s and his 80’s and while he may have lost a note or two near the end, he still had great command of both his guitar and his audience. And he looked like he was having fun. The blues is rooted in misery but playing the blues is a joy. BB knew that and taught us more than just the notes. So, goodbye Mr. Riley B. King and thanks for the lessons. This is a little more up my alley. BB with a mid 60’s ES-355. No whammy bar necessary. He called the oft maligned Varitone the “magic switch”. 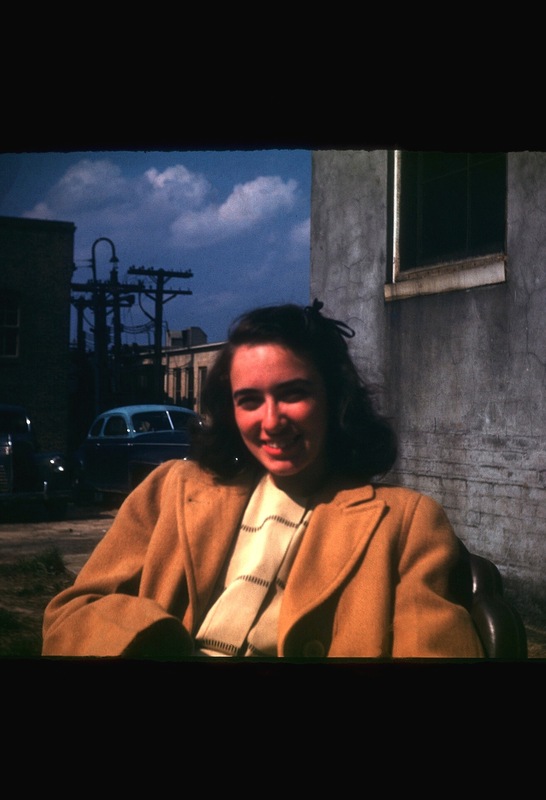 Liz Gelber circa 1946. Thanks Mom. Did your Mom yell at you to turn that thing down? Did she tell you that there was no future in being a guitar player? That maybe you should be a doctor or a lawyer or maybe a nice accountant? Mine did not and that’s just the beginning. My mother had nine children (all boys in case you think it was going to be easy). She’s been gone since 2011 but I think of her much more often than one day a year in May. 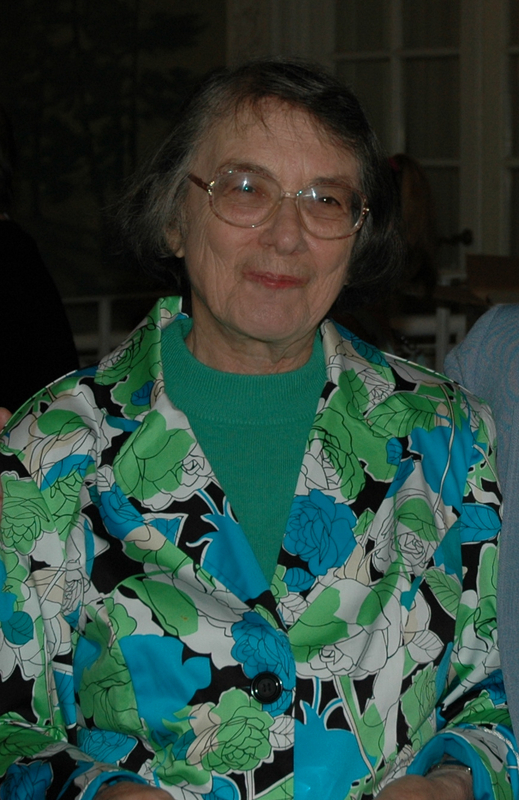 She always encouraged her sons to play a musical instrument. In fact, I’m pretty sure it was mandatory. We had a spinet piano in the living room which she played often and competently. She could sight read like you read the newspaper but she wasn’t going to be mistaken for a musician. Still, there were show tunes coming from the living room. Each of my brothers played at least one instrument. None of us were good enough to make a living at it but most of us stuck with it. I took violin starting in the 4th grade. I wasn’t very good. My parents added an organ to the living room when I was around ten (not a chord organ either-a real dual manual, no fooling’ around pedal board pro Allen) and I took lessons on that too. I wasn’t very good. My oldest brother, Ben-who also played violin, took to it and then there was Bach coming from the living room. The Beatles showed up in 64 and I bugged my father endlessly to get me a guitar and he came home with a flattop Kay that cost $15. I started guitar lessons and quit the organ. I still had to play the violin in the school orchestra (I switched to upright bass that same year). Mom made sure I practiced like she did with every other brother and every other instrument. The big surprise was that I was pretty good at it. They agreed to get me an electric guitar (Fender DuoSonic and Princeton amp in 1964) and my younger brother, Brian, who already played the oboe, albeit not that well, took over the Kay. He would take over the DuoSonic when I got the Fender Jaguar in 65. I would often practice in the living room with the amp turned up to somewhere around 11. And then there were Beatles songs coming from the living room. My Dad would come home from work and yell at me to turn it down but Mom never did. When she was in her 50’s, Mom decided it was time to learn another instrument. She asked me to help her find a cheap and playable guitar and we ended up with a German Framus flattop that had good action and she taught herself to play. I helped her with chord charts but she wouldn’t have it. She had to read music – not some chart. That was cheating. Just the notes please. She never got that far but she was never one to shrink from the task at hand. Mom had no fear. 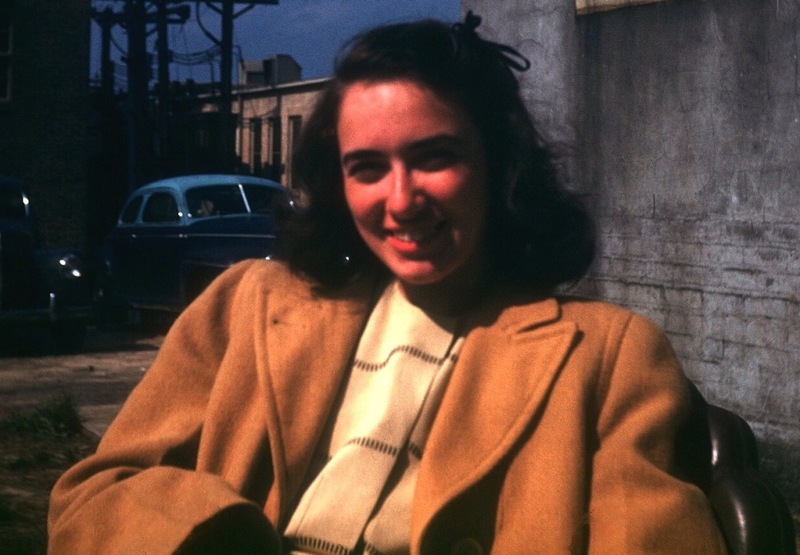 She learned to windsurf in her 60’s, built a path down to the lake behind our house, wallpapered the bathrooms, made a quilt out of my Dad’s old neckties and about a zillion other “projects”. She never excelled at any of them but showed a level of determination and ingenuity that has influenced me throughout my life. If someone says that something is so simple “…even your Mom could do it…”, they didn’t know my Mom. So thanks Mom. Thanks for the encouragement, your example and your unwavering support. And thanks to my wife, too, for carrying on the tradition of superb mothering. Our son is a pretty good guitar player and can play the piano better than my Mom thanks to the support of his Mom. In our house, there was Chopin and Gershwin and Lennon and McCartney coming from the living room. Liz Gelber circa 2005 Thanks again, Mom.